Digital democracy tools empower citizens. But many fall at the first hurdle. Most run on ever-changing political data that’s not simple to gather, or keep up to date. From our many years running TheyWorkForYou and helping other groups around the world with their own parliamentary monitoring websites, one thing’s very clear. In helping citizens to understand who their representatives are, the biggest challenge can be in keeping on top of an ever-changing set of information about politicians. By their very nature, parliaments change, and not always predictably. For developers and researchers, tending to data can be a time-consuming business that gets in the way of their primary aim. Enter the Democratic Commons, bringing together a growing community of individuals and organisations working to make information on every politician in the world freely available to all, through Wikidata. The vision is not just of sharing the data itself, but also of making the tools built on top of it available to all, so the civic and democratic engagement benefits can be extended to citizens all over the world. By its nature, the Democratic Commons belongs to all, as is reflected by its home on the collaborative Wikidata platform. We’re not its gatekeeper nor its owner, but we’re currently leading one part of the charge to get it up and running as a permanent, viable resource. We’re working with organisations and individuals in many different countries who are helping to ensure that the data for their own legislatures is correct and as complete as possible. If you’d like to learn how to do the same for your country, drop us an email. There’s already enough data on Wikidata to be of great use for researchers and coders working on political projects. Compare legislatures across different nations, or populate your web tools with your own current representatives. 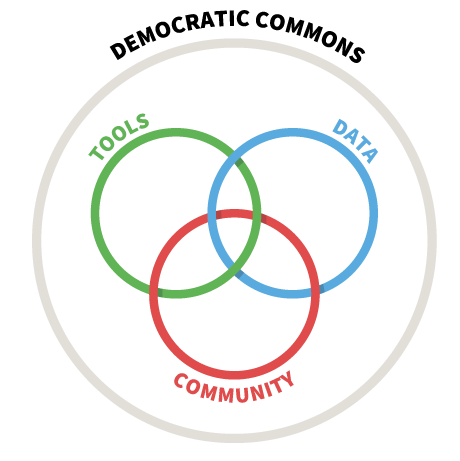 We’re working to this data model which evolves as our understanding grows. Your ideas and feedback are really valuable. Facebook’s Civic Engagement team have been using the data to inform people who their representatives are and how to connect with them, in the few days after a major election. Then there’s a tool enabling South African citizens to write in public to their representatives. That uses the WriteInPublic software, too. Data from EveryPolitician also feeds into Gender Balance, our app for assessing the male-to-female ratios in the worlds’ legislatures. … and because of the open nature of Wikidata, which is free to use by anyone, there are likely to be many more projects we don’t know about too.